For many college students, spring break is synonymous with catching some rays at the beach by day and partying hard all night. But over the course of three weeks in March, almost 800 beach-bound college students used their spring break not to kick back and relax or party, but to serve others and share their faith. 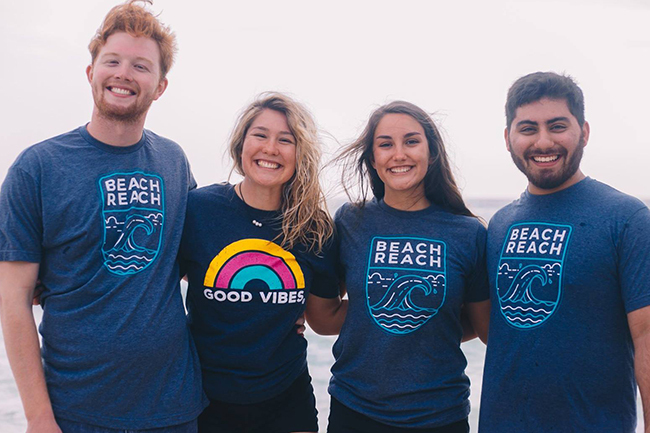 Students from across the country along with student ministry leaders gathered in Panama City Beach, Fla., March 3-22, to participate in BeachReach, an annual collegiate ministry event coordinated by LifeWay Christian Resources. BeachReach provides spring breakers free van rides, pancakes, and prayer as students demonstrate a willingness to meet people where they are with the gospel. BeachReach also added a disaster relief component this year—partnering with local churches to help underserved schools repair playgrounds and other facilities that were damaged by Hurricane Michael. As a result of these acts of service and the conversations they sparked, 42 spring breakers expressed faith in Christ this year. To help students visualize how the Holy Spirit was working over the course of the three-week period, each new believer’s name was written on a beach ball and attached to a display known as the Salvation Wall. At BeachReach, many gospel conversations originate in church vans and buses converted to free shuttles that transport students around the popular spring break destination. LifeWay employees serve as dispatch coordinators to handle the logistics of this service, which this year provided 13,247 free rides. Students often give vans creative names like Van Gogh or Sir Vancealot and write the phone number for rides on the side. Spring breakers also learn about the service through street teams that hand out cards and engage people as they’re walking around. Each 12-passenger van is arranged with at least four BeachReachers—a driver, a navigator who handles logistics, someone in the back to monitor the safety of the vehicle, and one person in the “hot seat” to take the lead in steering conversations toward Christ. It’s often passengers, however, who initiate the conversations. Meanwhile, street teams pursue similar conversations on foot around town. They pass out cards, help people call in for rides by letting the dispatcher know how many people are in a party and where they’re traveling, and start conversations while waiting for vehicles to arrive. While teams in vans and on the street are serving people and sharing the gospel, another group of students covers them in prayer. “We have prayer shifts that run until 2 a.m. each night,” Noe says. Back at the BeachReach home base, students gather in the prayer room to watch a large screen with a live feed of information texted in from BeachReachers in the field. While the prayer room and phone lines close at 2 a.m., BeachReachers serving in vans might not finish their runs until an hour later. For that reason—and to accommodate the sleep-in habits of spring breakers—a pancake breakfast is served in a bowling alley each day from 11 a.m. to 1 p.m. BeachReach volunteers served more than 12,000 pancakes. BeachReach is much more than pancakes and van rides, Noe says. It also serves as a classroom for teaching students to share their faith. For this reason, Noe and other college leaders see the event’s greatest impact happening in the lives of students who learn how to share their faith over the course of BeachReach.